A Turning Point in the Climate Protection Fight? The news is not all bad, however. Three recent events since the report’s release raise the possibility that this time the alarm might actually be registering. The U.S Environmental Protection Agency (EPA) unveiled on June 2 its long-awaited plan to reduce greenhouse gas emissions from power plants. The EPA’s proposed Clean Power Plan would, if approved, direct states to develop a range of programs to cut carbon dioxide emissions from power plants by 30 percent from 2005 emissions levels by 2030. 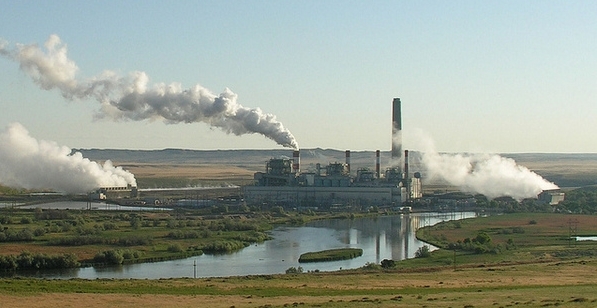 The Dave Johnston coal-fired power plant in Wyoming. The new rules mark the first time any U.S. president has moved to regulate carbon pollution from power plants, the largest single source of carbon dioxide emissions. Although arguably establishing goals that are too little and a deadline too late to prevent runaway climate change, the Obama administration sent a clear signal that it was finally willing to expend some significant political capital on the fight for climate protection. Providing further hope that the proposed carbon regulations might mark a turning point, the U.S. Supreme Court on June 23 largely upheld the authority of the EPA to implement the proposed regulations, making it much more likely that the agency could fend off challenges from industry and conservative opponents. The very next day a bipartisan group of senior political and business leaders, including three former secretaries of the Treasury, endorsed putting a price on carbon, warning that enormous deposits of oil and coal will have to be left in the ground to avoid reaching dangerous levels of global warming. In their report, “Risky Business,” the group outlined the economic impact of climate change, highlighting how climate change was becoming a serious financial issue for corporations. In a New York Times op-ed launching the campaign for a carbon tax, former Treasury Secretary Henry Paulson contended that “we’re staring down a climate bubble that poses enormous risks to both our environment and economy.” Paulson, who served in the administration of George W. Bush, compared the mounting climate crisis to the financial crisis of 2008 and the collapse of the economy that followed. Maybe, just maybe, the dam of political stalemate is beginning to break and the U.S. will finally adopt a coherent and effective climate and energy policy. You can be sure, however, that witout systematic and sustained pressure from the grass roots the necessary changes will never take place. That means that it’s up to us. But it’s certainly nice to see some of our political and business leaders finally lining up on our side.